Apple published its workplace diversity numbers, the latest in a parade of big tech companies such as Google, Twitter and Facebook to respond to a request from Jesse Jackson and his Rainbow Push Coalition to reveal what the civil rights leader calls the opportunity gap in tech and highlight ways firms can better reflect the consumer demographics they serve. Of Apple’s 98,000 employees, whites dominate leadership, tech and non-tech positions, holding shares ranging from 55 to 64 percent in each category, according to data the company posted on its site today. And while 55 percent of the company’s total U.S. workforce is white, only 15 percent are Asian, 11 percent are Hispanic and 7 percent are black. Women make up around a third of the company’s global workforce, with 28 percent of leadership positions, 20 percent of tech posts and 35 percent of non-tech jobs. Apple CEO Tim Cook released a statement with the data: "Let me say up front: As CEO, I’m not satisfied with the numbers on this page. They’re not new to us, and we’ve been working hard for quite some time to improve them." The Rainbow Push Coalition noted that Apple fared better when compared to the other companies that have reported. Jackson said in a statement: “I called Tim Cook’s office this morning to personally commend him for stepping up to the plate to make the announcement. It shows his personal commitment and his leadership." So far about half of the 20 tech firms the Rainbow Push Coalition has reached out to have responded. 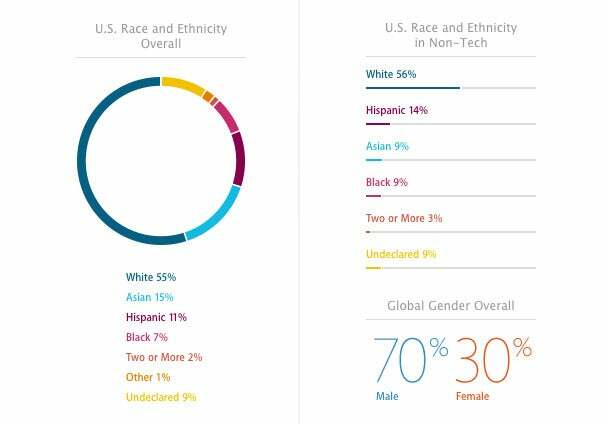 Since the spring, one-by-one, bold-faced names such as Google, Facebook, Twitter and Ebay have posted their own diversity stats on their own websites. There have been some notable hold-outs. Twitter initially refused to release its data but relented after Jackson’s group started an online petition. The drive gathered 25,000 followers in less than a week, according to Jackson. After releasing their diversity stats, Twitter and others have also pledged in public statements to conduct more inclusive hiring and promoting practices. Dr. Juan Gilbert, chair of the Computer & Information Science & Engineering Department at the University of Florida, says from a historical perspective, these stats aren't reporting anything new. But Jackson has loaded the campaign with several heated issues: "He's focused on a field where its biggest companies have shown strong revenues," says Gilbert. "Couple that with computing and IT's role in domestic security, the fact that the field is producing a lot of jobs for foreign nationals and not necessarily U.S. citizens, women or minorities. All these factors in this one campaign is causing tension and urgency." Butch Wing, director of Rainbow Push Silicon Valley, says Pandora has expressed a commitment to releasing their figures soon. Data was also requested from Amazon, Broadcom, Oracle, Qualcomm and Yelp.